Well only a day or so after we intended (but minus the link-up with the Social and Climate Justice Caravan, we’ve arrived in Copenhagen. First impressions? Beyond the rain and the terrible exchange rate, the first thing that struck me was the adverts. Every global corporation worth its salt wants to position itself as a green guardian of our collective future here, and there seems to be no escape. The first bus shelter we saw when we walked out of the station was carrying a Coca-Cola 'Hopenhagen' advert extolling you to buy ‘A bottle of hope’. I’m sure the folks at Coke Justice resisting Coca-Cola’s threats to local water supplies in India and elsewhere would have a few things to say about that. Then when we changed buses we found ourselves next to the global advertising industry’s massive outdoor Hopenhagen exhibition. With so much hope in the air, and Obama due to jet back in next week, it’s a wonder a deal hasn’t already been reached. One big disappointment about the bus breaking down was that we missed today’s standout session at the Klimaforum - the two-week civil society counter-conference taking place in the centre of Copenhagen - a panel discussion on Ecological Debt and Climate Justice featuring the Bolivian Ambassador to the UN, Angela Navarro, Canadian author Naomi Klein, as well as Lidy Nacpil from Jubilee South, and Ricardo Navarro from Friends of the Earth El Salvador. There’s a follow-on session tomorrow, though, so I’ll see if I can catch up then. Without the bus our accommodation plans have been somewhat scuppered. So tonight we made our way to a converted warehouse at the north end of the city centre. Converted, that is, into crashpad accommodation for the hundreds of people who have turned up in Copenhagen without a place to stay (all the hotels were booked up months ago), but featuring that most essential Copenhagen home comfort – electric heaters. After grabbing a vegan dinner from the People’s Kitchen (several have been set up by Danish activists at ‘convergence centres’ around the city) we hit the floors in preparation for our first day proper. Well it's been a valiant effort, and Matt has captured the whole thing on film so there's a disaster movie coming soon to cinemas near you, but we've had to abandon ship (or bus). After two days of heroic efforts from Norman our driver and Ian the bus's owner on a phone from Shropshire, we've had to admit defeat. We tracked down a Routemaster specialist in South Coulsden who had the spare parts we needed. He gave us the inverter and the belts, we fitted them, then we whisked the bus off to Bexley Heath bus garage for a once-over from some proper bus mechanics and a bit of spring cleaning, and hit the road again. But this time we only made it as far as Maidstone Services before the bus ground to a halt again! Norman thinks it could make it as far as Dover, and possibly all the way to Copenhagen, at 15mph, but we wouldn't get there til it's all over. 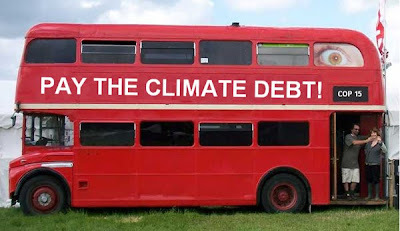 So tragically the Climate Debt Bus is no more. It's being towed back to Shropshire this evening. We're now looking into alternative routes to Denmark - it's looking like a ferry is the next greenest (and cheapest) option, aside from flying, but the next one isn't for two days. Let's hope our breakdown isn't a premonition for the fate of the Copenhagen talks. One of the passengers on our bus is Theo - a singer-songerwriter and activist who's written a special song for Copenhagen. Theo Bard - Having A Good Time from TAPE REC on Vimeo. Theo says: "It's just a humble little song but it's had a lot of time and effort poured into it, from scrawling out words and making them rhyme, to trying to get it perfect in front of a microphone, and then hotfooting around london trying to shoot the video on a tiny budget. If you like the song, you can buy it. To buy the song with minimum cash being lost to online commissions, please click this link. You can also buy it through all online music retailers." Mechanical work still going on. We'll keep you updated. Bus breaks down in Peckham! Well we haven't got very far! Just as we reach our top speed of 40mph on the way out of London, the bus has come to a halt on the hard shoulder. Matt the filmmaker loves the drama, but for the rest of us it's not a good start. After a bit of looking under the bus, it seems we have a serious problem - the inverter has gone and two out of three belts have snapped. My mechanical skills are not up to much, but spare parts for Routemasters are not available in your average Co-op. Plus it's raining. As it happens, Norman our bus driver has access to an empty house up the road in Bexley Heath, so we limp the bus there and set up camp for the night. 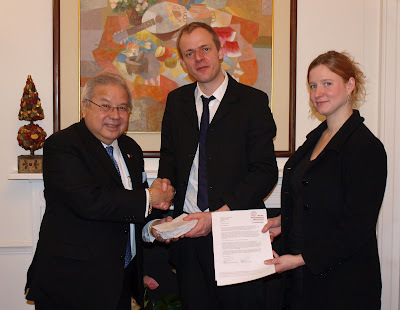 The bus has made it to London and we’ve been touring the town – handing in a ‘climate invoice’ to Gordon Brown and ‘climate cheques’ to representatives of developing world countries. 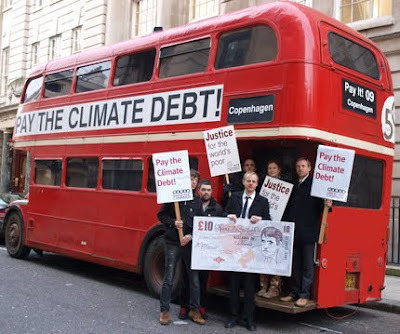 In recent weeks our supporters have completed thousands of petitions telling the British government to pay its climate debt and standing united with developing countries in their determination to ensure economic justice is at the centre of a deal on climate change. The petitions demand that the UK pay £17 billion each year to developing countries as compensation for the climate change that the UK has caused. Our petition was accepted by our own Gordon Brown, as the real one refused to come out. Gordon was then off on a tour of embassies to repay the debt. We met ambassadors and representatives of the Indian, Philippine, Bolivian and Bangladeshi embassies. We left a strong impression and kept the pressure on the Government to agree a just and equitable agreement at Copenhagen, as well as encouraging poorer nations to stick to their demands in the face of strong opposition. This event took place at the start of a fortnight of action in the UK, including the Wave which will take place on Saturday and is to be the biggest climate change demonstration in UK history. Now our bus – running on recycled chip-fat- is off to catch the ferry to Calais on the first leg of our journey to Copenhagen. It will travel through Belgium, France and Germany, and stop off at Brussels (where we will take part in a demonstration) and Cologne and Hamburg (where we will meet the climate caravan) before settling outside the Klimaforum, the activist counterpart to the UN conference. As the World Bank and IMF continue to meet in the $220 million bunker of a conference centre in Istanbul, protestors have taken to the streets to show their anger and hostility towards the international financial institutions, which have imposed harsh and undemocratic conditions on Turkey as part of a typical neo-liberal restructuring process. While some of us were sitting in an office downtown, strategising over how to campaign on issues like debt, conditions, and the need for global economic transformation, the rioters outside were making their point more directly. We could smell the tear gas and hear the smoke bombs the police used to disperse the protestors, and later walked through streets covered in broken glass and puddles left by water cannons. The eruption of protest here in Turkey goes to the heart of the matter: the Bank and Fund are meeting here to congratulate themselves on averting global meltdown, and discuss some minor tweeks and requests for more funding, which will allow them to continue to direct and dominate the global economy. Meanwhile the people of Turkey, and of international civil society more widely, are demanding much more radical changes - the end of the hegemony of these institutions and the ideology they represent. The challenge for us in the North is how we can best stand in solidarity with their demands, and work together to see genuine transformation in the way the world economy is managed. 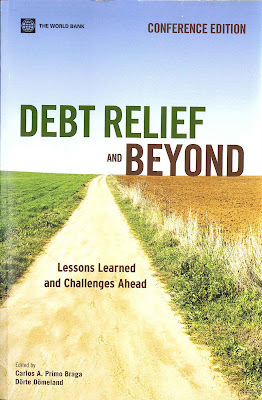 Debt relief – will this time be different? This was the question being asked by World Bank staff and other ‘experts’ on a panel at the Annual Meetings. The event marked the launch of a new Bank book, Debt relief and beyond, which assesses progress under the Heavily Indebted Poor Countries Initiative (HIPC) and the Multilateral Debt Relief Initiative (MDRI) and other challenges on the debt issue, including a section on odious and illegitimate debt. The focus on debt is welcome, especially as the issue is quite marginalised in these meetings otherwise. Countries that have had debt relief have seen increases in social spending, and in some cases indicators such as child mortality have improved. Plus the better debt situation of countries after HIPC and MDRI means they were better able to face the global financial crisis. However the tone of the discussion looking forward was alarming. Now, a new debt crisis doesn’t seem likely, we were told, although many poor countries are vulnerable, a dozen or more are in severe debt distress, and the outlook is uncertain. Given this prognosis, no real thought seems to have gone into what should be done, beyond imposing the newly-flexibilised Debt Sustainability Framework, and hoping that donors won’t cut back on grant aid. More urgent and radical thinking is needed. Civil society representatives called for a new debt work-out mechanism to deal with future debt problems, and the Norwegian government minister Solheim spoke of the importance of responsible lending standards, but the Bank's approch seems to be a mixture of wishful thinking and sticking their heads in the sand. In which case it is hard to see how this time things really will be any different. Local civil society groups, academics and students have organised an alternative conference, Critical Voices on the World Bank and IMF and the World in Crisis, at Bilgi University in Istanbul, shadowing the official meetings taking place this week. The conference is providing some refreshingly different perspectives from much of the programme at the official conference centre. Yesterday saw presentations on the IMF and its role in Turkey, as well as other emerging and developing countries. Professor Erinc Yeldan gave a detailed analysis of the impact of IMF conditions on Turkey, where inflation has been pushed down, but interest rates continue to hover high, unemployment is soaring and the public debt is huge. He pointed out that the Fund’s growth model is based on capital inflows and a growing financial sector, not growth in the real, productive, job-creating economy. Professor Robert Wade from the London School of Economics was in town to give his perspective on the IMF’s logic that markets are 'efficient' - this means the aim of their programmes is to impose domestic austerity in order to restore investor confidence, because the financial markets will make 'correct judgements' about the situation on the ground once stability is restored. As well as questioning this logic, Wade pointed to the issues that have been masked and ignored by following it, for example the huge income inequality, both within countries and globally. This inequality means most people have less income, so demand stagnates, while the super rich put their wealth in the money markets, creating grand casinos of ultimately deadly fragility. Nuria Molina, new director of Eurodad, talked about whether the IMF has really changed, as their PR would have us believe. Certainly they have removed some conditions and been more flexible in the downturn. But the harsh macroeconomic conditions are still there – if put off until next year in some places. And there is even evidence of the old structural conditions that are supposed to have been abolished – she gave examples of conditions imposing trade liberalisation in the Republic of Congo, privatisation in the energy sector in Kyrgyz Republic, and removing fuel subsidies in Ethiopia. Joseph Stiglitz, nobel prize laureate and chair of the UN's expert committee on the financial crisis, addressed a seminar today at the IFI annual meetings on the problems with the G20's lack of legitimacy and inclusivity. He focused on the ways that the absence of 172 UN member states from the G20, which has become the new global forum for economic governance, has meant that policy decisions have ignored or worsened the plight of the poorest countries and the poorest people within them. These countries are not represented and so their voices are not heard. The first problem Stiglitz identified was the fact that the key response of the G20 - to lend more money through the IMF - is creating huge new debts for low income countries. This at a time when many are just emerging from the debt relief process with relatively better debt situations, only to have these undone by the need to borrow more to protect social spending and invest in their economies. The downturn is going to be long, Stiglitz warned, so why saddle countries with more debts now? They need grant based finance instead, and a new framework to deal with sovereign debt. Unfortunately, no one at the Bank and Fund seems to be listening - they're going to approve a revised debt sustainability framework here in the next few days that will let lenders provide more expensive loans, and even less grants. And a new debt work-out mechanism is not on the agenda at all. More signs that the rich and powerful are calling the shots when it comes to decisions about the global economy. Last night saw the main opportunity for civil society groups to quiz Bob Zoellick, President of the World Bank, and Dominic Strauss-Kahn, Managing Director of the IMF, at the annual Town Hall meeting. Zoellick concentrated his remarks on the "dangerous moment" we are now in, the biggest threat now being complacency. He also talked about the food crisis, and commented that the G8 deal for $20 billion for food security was still only "words on paper". He mentioned the $11.6 billion funding gap the Bank has identified, which is for just 43 countries to cover their core social spending commitments, and said that, in contrast to the Fund, the Bank still needs to raise a lot of money to meet the needs of poor countries. Strauss-Kahn said that, while we were at the start of recovery, there would be a long delay before employment stopped rising. And it was too early to implement so-called 'exit strategies'. He talked about the changing IMF role, with a new facility for low income countries (still loans with strings attached though) and reform to the quota in the Fund's governance (fairly meagre changes in reality). The IMF, he said, needs to promote stability as well as prosperity (if only they'd been doing that 2 years ago!). Chaired by Archbishop Ndungane of South Africa, questions from civil society representatives ranged from governance and transparency to specific policies on agriculture, gender and disability. But they generally failed to critique the institutions' central role in this crisis, and only one question targetted the Fund, which is worrying given that organisation's massive renaissance in the past year. Such a set-piece event was never going to be very critical or alternative in its perspective - hopefully some of the alternative forms and meetings being planned in the margins of this conference will provide more inspiration in the coming days. This year's meetings of the IMF and World Bank are taking place in Turkey, a country that hasn't always had the most straightforward relationship with the international financial institutions. Last year the Turkish Prime Minister commented that "We will not cast our tomorrows into darkness by bowing to IMF demands at such a time of crisis". So far the biggest headline of the meetings seems to be the moment when a Turkish student threw a shoe at IMF Managing Director Dominic Strauss-Kahn at a meeting on Thursday. Strauss-Kahn later commented that Turkish students were at least polite enough to wait until he'd finished speaking to throw their shoes. Zoellick's main message so far has been the need to counter 'complacency' and that although economic recovery may be starting, it will be slow and uneven. Strauss-Kahn has been talking about the Fund's role in promoting stability as well as prosperity.